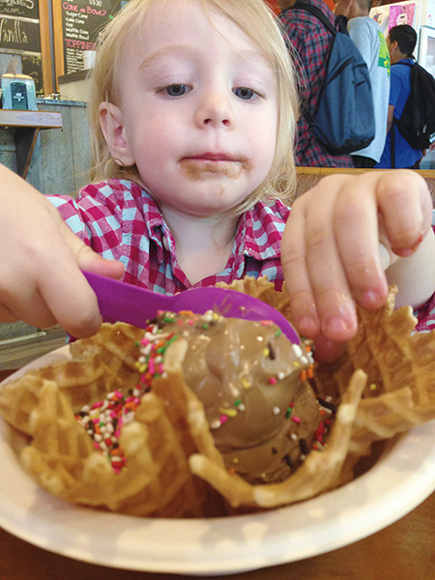 Rich and creamy, Peaks Frozen Custard is a local favorite on hot days. So, even though the brand is stocked in grocery stores, we decided to make a trip to their brick and mortar shop as a fun family outing to celebrate the surprising 80 degree weather. They feature special flavors that change daily but always have chocolate and vanilla. 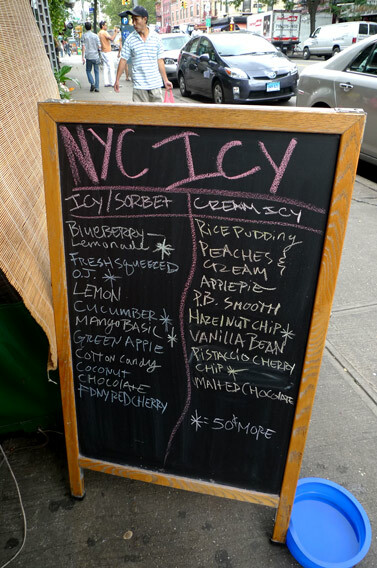 I’ve mentioned the creamy, slushy summertime delights of Uncle Louie G’s before but am happy to say they’ve made Greenpoint their newest home. 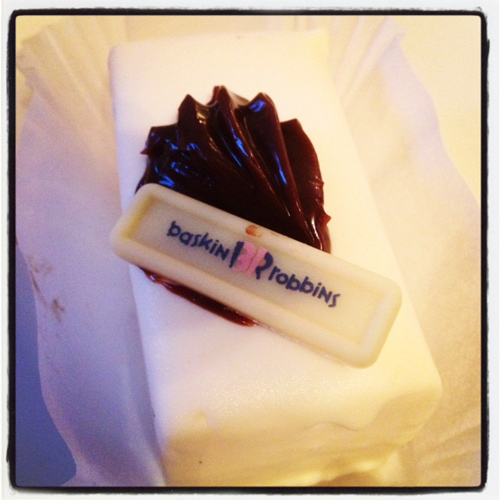 Little kids’ ice cream cake isn’t the most high brow pregnancy craving request, but Jim found that Baskin Robbins classes things up a bit when he surprised me with their mini cake. Vanilla on vanilla ice cream and cake inside is coated in a thin, pleasant shell of white chocolate. 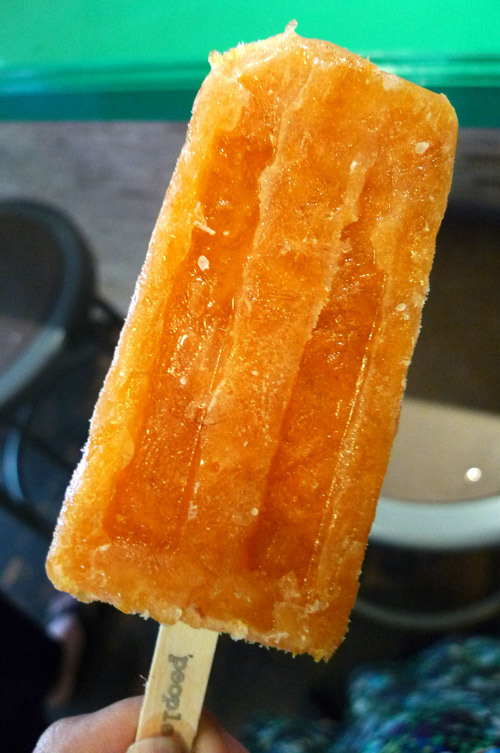 There is almost an overwhelming amount of fancy, artisinal ice creams out there but Soco is worth a mention. 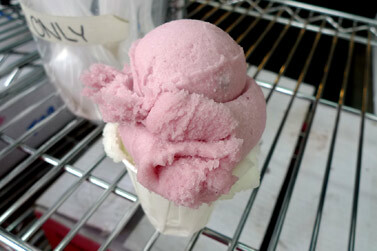 From a Massachusettes family owned “micro-creamery” which has a brick and mortar shop in the Berkshires. You can find it locally at Whole Foods and other places where you usually find this kind of stuff as well as Fresh Direct. We’ve tried the Espresso Cookie but am on the look out for Earl Grey – a flavor I fell in love with at Van Leeuwin. Excuse my absence, Van and I have been in a pit of stomach flu sadness. One of the only things I’ve been able to eat? 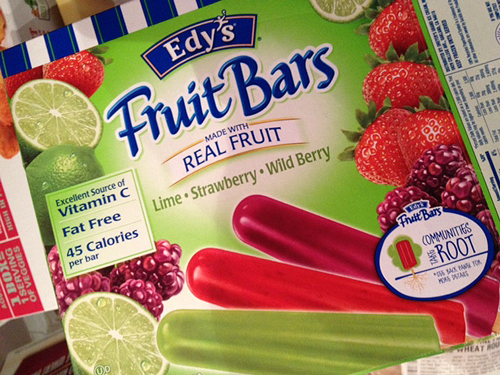 Edy’s Fruit Bars. But whaat?? No usage of the words “organic” or “hand crafted”? Yes, Edy’s fruit bars aren’t going to win any yuppie awards for their garish presentation; next to all the fancy stuff out there (that I totally lap up, btw) this box looks like a throw back, a sweet snack you’d have to resort to at your dieting aunt’s house in a moment of desperation. Except these are surprisingly good! Refreshing, buy not too sweet, they taste like real fruit. And great for sick tummies! Two of the most lasting memories to my taste buds from a recent Minneapolis visit come from the cute, comfy cafe, Crema. The namesake beverage, crema, was stunningly delicious both in hot and cold form – think of the creamiest coffee ever and add a perfect sweetness. 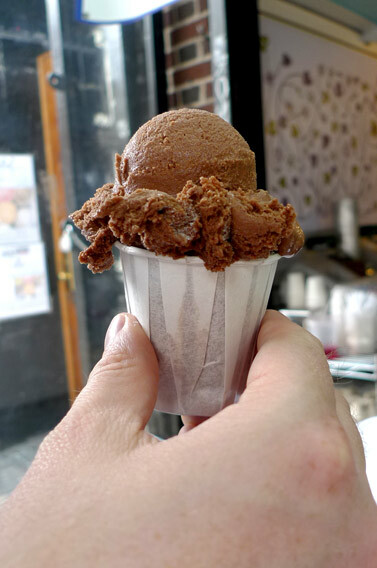 And if that’s not enough endulgence, you simply can’t leave this place without a scoop of Sonny’s small batch homemade ice creams (yes, even if it means you’ll be having ice cream after brunch). I went for it and sampled their wildest flavor – pesto – and found it remarkably refreshing and nice in that the herbal taste balanced out the sweet. So yummy I got a big scoop of it. The backyard is romantic, the staff ultra friendly, and oh yeah, the food here is tasty too. Father’s Day afternoon: Van is sacked out in my arms, so (best daddy ever) Jim has to go down to the land of I-forgot-to-get-a-cake, the Baskin Robbins attanched to the Dunkin Donuts for his own Father’s Day Cake. As someone familiar with Carvel and Hersheys cakes in the past, I expected that strange sugary plastic icing and ultra sweetness. To my surprise, Baskin does things a little classier. The icing is more like whipped cream and doesn’t even coat your mouth with oddness. 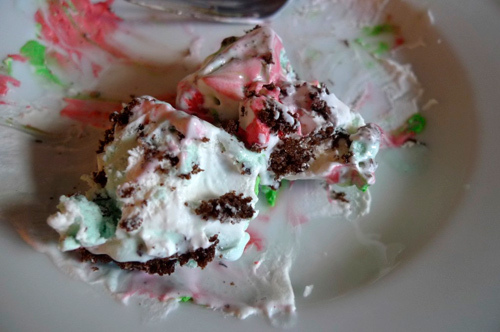 It does, of course, still end up looking like some crazy clown nightmare by the time you’re nearly done though (see photo), as all ice cream cakes should. An ice cream sandwich is a delicious concept but I often find them disappointing. Usually either the cookie or the ice cream (or both) are sub par. 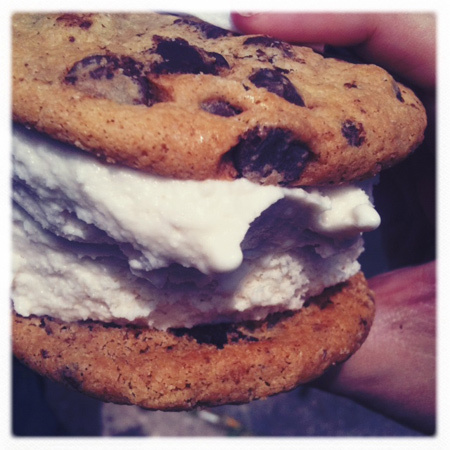 Not so with the Coolhaus truck that simply combines delicious Ovenly cookies with creamy, exotic flavored ice creams. You pick and choose your sandwich combo, a feature that drew us in, but the fact that our rosemary butterscotch on chocolate chip was so overstuffed, sloppy, and scrumptious is what will have me coming back for more. 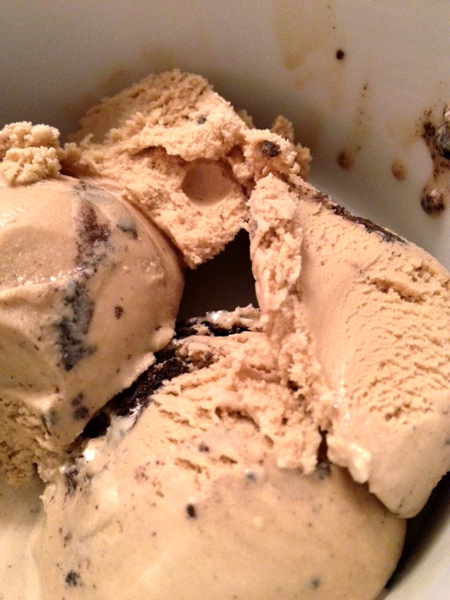 After all, wouldn’t you be curious about pistachio with black truffles and olive oil gelato? 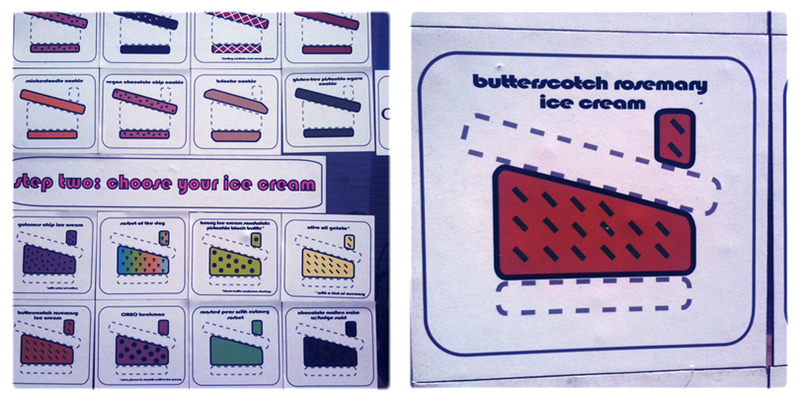 If you live in LA or Austin you can indulge your curiosity at one of their trucks. Locally, it hangs out in front of the Artists and Fleas market on North 7th every other Saturday this Summer. 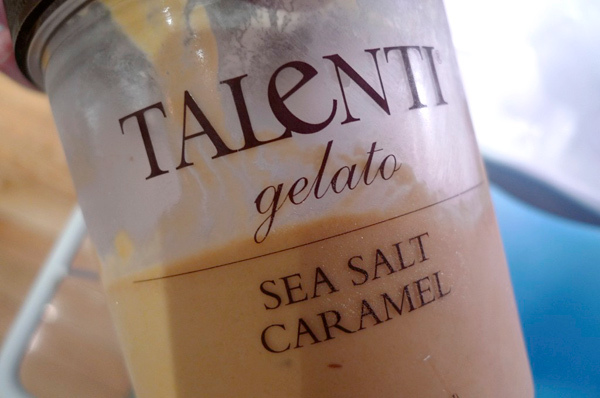 A tub of gelato that reads “sea salt caramel” may just as well say “buy me!” This Talenti brand gelato is rich, creamy, and doesn’t shy away from the sea salt part of the equation. Really delicious stuff, and some I’ve only just noticed on store shelves. I look forward to trying some of their other flavors like Peach Champagne and White Chocolate Raspberry. 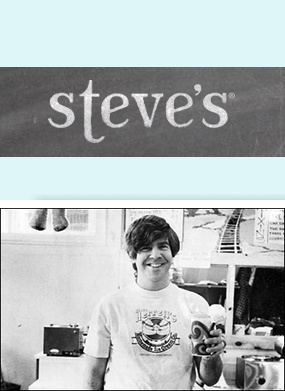 Steve’s Ice Cream began the gourmet ice cream revolution back in 1973. And now they are back! Truth be told, I had no idea of the company’s history when I indulged in a scoop of their Vanilla Bourbon. All I knew was that I was experiencing something quite exceptionally awesome. Made in small batches and popping up all over Brooklyn, it is a great idea to seek these pints out if you count yourself an ice cream fan (and the Vanilla Bourbon flavor would also appeal to boozers – with a candied orange peel this is like an Old Fashioned in dessert form yummmmm). 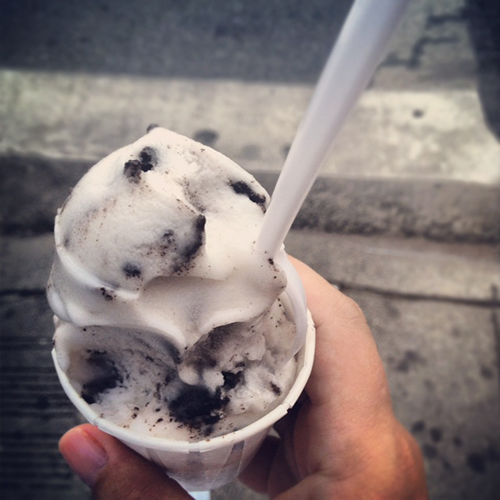 First, People’s Pops and now NYC Icy, this is turning into my summer of frozen treat delight! This critical fave seems to have opened, closed, reopened all over the city many times before settling into this hole in the wall shop off Thompson Square park. I haven’t been in the area but have been meaning to swing by and curse myself for not making the trip sooner. 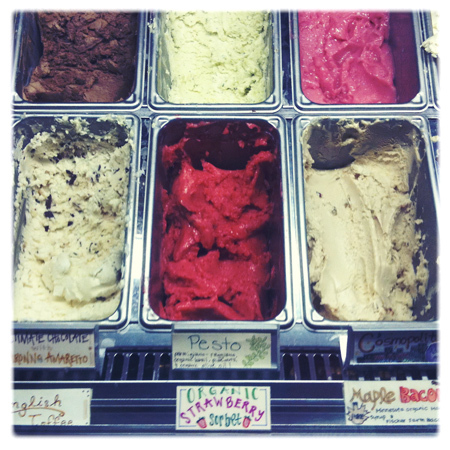 Soft, smooth sorbets and cream ices come in an array of tantalizing flavors. I opted for a tart but balanced blueberry lemonade and an absolutely amazing and refreshing cucumber. Jim’s malted chocolate was quite decadent. I really can’t recommend this place enough and can’t wait to go back for more (then eat it in front of the gutter punks). As you can tell from all the photos I’ve been sent from Shaun, People’s Pops, located in the Chelsea Market, is his new obsession and subsequently, mine. 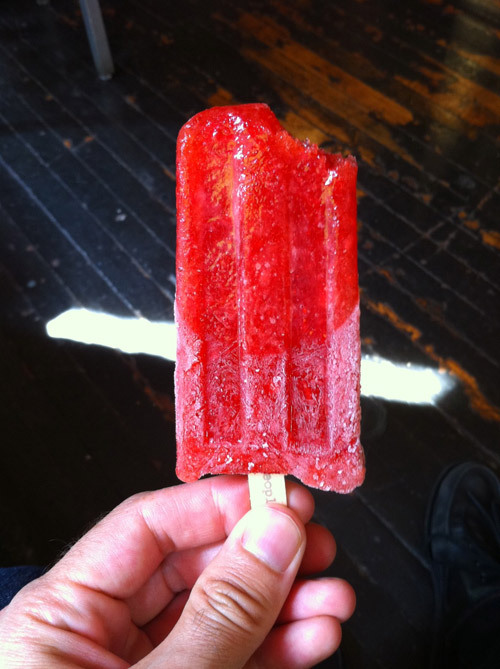 Can you think of a more refreshing sweet than fresh local fruit popsicles with winning combinations like raspberry/mint, strawberry/rhubarb, yellow plum/mint and apricot/cardamom? I was so jealous of Shaun’s many visits and finally went myself the other day. I ordered the apricot/cardamom at the counter guy’s recommendation and it was out of this world. Future days in the city will revolve around a stop by this place for the rest of the summer. 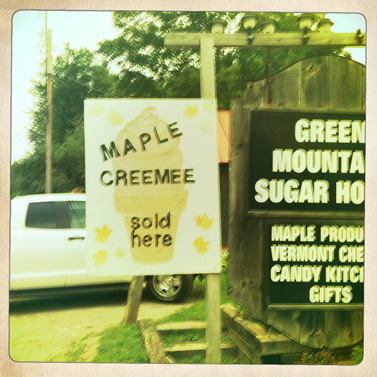 I’d never heard of the intriguing Maple Creamie before – but just a few queries about our summer trip to Vermont to some locals and it’s on nearly everybody’s list of must do’s. 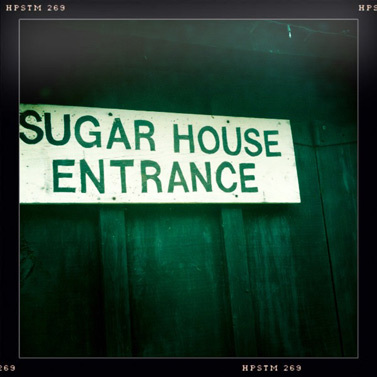 Fortunately we had a great spot near our Rescue Lake cabin for trying the local delicacy called the Green Mountain Sugar House. 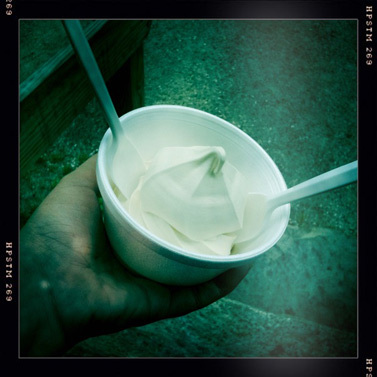 Leave it to the proud Vermonters to make a frozen dessert from their favorite export, and like the (real, non-plastic brown bottle) syrup, a creamie has a distinct sweetness with that maple after taste that beats the sugary chemical taste of many soft serves. These tasties can be found all over Vermont in roadside sugar houses and farmer’s market and it doesn’t seem like a Vermont summer is complete without one. 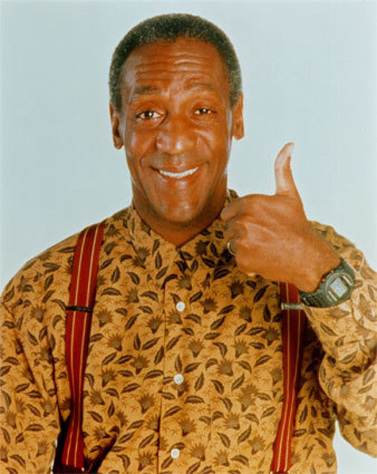 That old American classic, the Bill Cosby endorsed pudding pop – where did it go?? 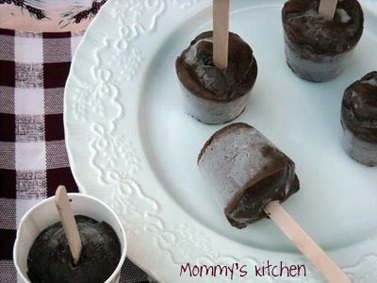 Well, no need for panic, they can easily be made at home by simply freezing in paper cups. Rainbow Sprinkles have pretty much been the biggest pregnancy craving I’ve had and I’ve been loving them so much, they were even the theme of my work goodbye party – complete with a mega sized container of the little toppings for at home desserts. 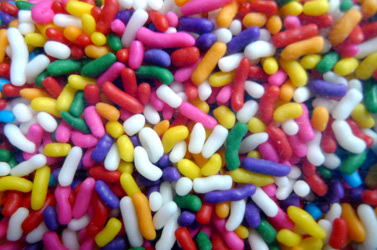 By the way, I do not refer to these as Jimmies. 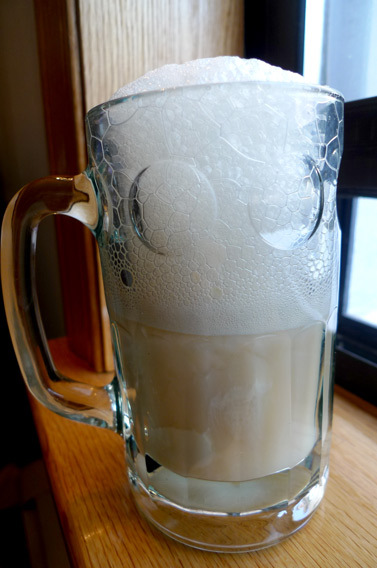 Not sure about the inclusion of vanilla extract, it gave this Sparkling Vanilla Float a bit of a chemical taste, but otherwise, this is float with less sticky sweetness because it uses seltzer instead of soda. I also used frozen yogurt in place of ice cream. When Uncle Louis G‘s opened in Williamsburg down the street from my very favorite Italian ice shop, Ralph’s (who features a larger selection of the cream ice flavors) I thought it would work out fine for everyone involved. But in the summer sweet turf war, Ralph’s fell and Uncle Louis G’s was left standing. So, to the victors go the spoils. I’ve already stopped by the shop a couple times this season, before summer’s even arrived (though the weather doesn’t seem to know it) for some vanilla chip. Once even opting (because I am pregnant and can) for a pint to bring back to the fridge to enjoy over several days. The family run Williamsburg location also features an awesome head shot of the young man who scoops your ice cream for you, while the Park Slope location is convenient to the park, features an almost mockingly torturous black metal bench to sit on that gets scorching hot in any weather nice enough to enjoy an Italian ice in.